Osisko Mining (OSKFF.PK) poured the first gold from their Malartic mine in April after spending slightly more than two years building out the mine. While most investors chase mid to large cap names in the Americas, Africa remains the final frontier for gold mining stocks based on a number of factors. Political risk in North Africa, rumblings about nationalization in South Africa, and the stability or lack thereof in Zimbabwe and Somalia can be enough to give many investors pause. But for those who take a look closer they will find compelling stories and valuations in Central Africa and with one of those companies being Banro Corporation (BAA). Banro has 13 Exploitation Permits along the Twangiza-Namoya gold belt in the Democratic Republic of the Congo which is similar in size and geology to the famous Ashanti Gold Belt in Ghana. Within the 13 permits four deposits have been discovered. The first deposit, Twangiza, is on schedule for completion in the fourth quarter of 2011. The mill, located on top of a mountain, will process 1.7 million tonnes per year with an annual production of 120,000 ounces of gold for the first 5 years at cash cost of $356 per ounce. According to Michael Cooper at CFMonitor.com cash costs could rise to $450 per ounce with the effects of oil price increases, still at the low end of the cost spectrum. The latest 43-101 for Twangiza shows Measured and Indicated Resources of 5.6 million ounces of gold of which will be upgraded to Proven and Probable in the third quarter to this year. Cash flow from Twangiza will go towards the build-out of the Namoya project in the southwestern part of the gold belt. Namoya is expected to cost $118 million to build and produce an estimated 124,000 ounces of gold per year when completed at a total cash cost of $400 per ounce. Project capex would be paid back in one year’s time at current gold prices. Upon completion of Namoya cash flows will be directed towards the creation of a hydroelectric plant 25 km from Twangiza which could be built without a dam and provide enough power to reduce production cash costs at Twangiza Phase 1 and 2 by $100 per ounce. Twangiza Phase 2 will access the ore at the bottom of the mountain using a new processing facility with an estimated capex of less than $400 million. The final two deposits, Lugushwa and Kamituga, are still in the exploration phase and show strong upside potential. Once the first three projects are complete Banro will have an estimated annual gold production of almost 500,000 ounces by 2016. Banro has been active in the local communities as well building schools through the Banro Foundation building two high schools, two primary schools, a health care center, and the rehabilitation of local infrastructure. Investors have spent the final few years racing towards the low hanging fruit in the mining sector grabbing companies with properties in the Americas. While many have done well Africa has been largely ignored but that may be changing soon. Despite swimming in cash from high gold prices mining companies are finding that excess cash gets eaten away by inflation for large scale projects. Inflation is beginning to rear its ugly head in Brazil and Argentina where they are fighting inflationary forces for different reasons. Already we have seen capex numbers increase by more than 25% for projects like Cerro Casale or be scaled back as is the case with Galore Creek in Canada. The threat of nationalization in Bolivia and higher taxes in Peru has been giving companies consternation as project costs rise and margins fall. In the Congo, inflation risk is stabilizing as the inflation rate trends lower and economic growth moves forward. In a sign of increasing faith in the long-term future of the Congo, Newmont Mining (NEM) recently took a 16.8% stake in Loncor Resources (LON) which holds rights to more than 21,000 square kilometers in the Congo. While Newmont’s production profile has been flat for the last few years Africa is the only area showing growth. The investment in Loncor is not just an investment in an exploration company with strong potential but a stamp of approval for the Congo. While investors are rushing into gold and silver stocks located in the Americas Africa remains overlooked. Instead of chasing returns investors should look for value in African mining stocks like Banro who will enter into production later this year and rising to almost 500,000 ounces per year by 2015. Communications are intended solely for informational purposes. Statements made should not be construed as an endorsement, either expressed or implied. This article and the author is not responsible for typographic errors or other inaccuracies in the content. This article may not be reproduced without credit or permission from the author. We believe the information contained herein to be accurate and reliable. However, errors may occasionally occur. Therefore, all information and materials are provided “AS IS” without any warranty of any kind. Past results are not indicative of future results. The problem with making a year long commentary is that things can change which throws off your initial theory. That was the main problem with my forecast as Bernanke decided to launch QE2 amidst criticism from global central banks. This put a floor under the market and lit the fuse for the rally in equities and commodities. So what happens in 2011 and how does that affect investment portfolios? From my chair looking out over the world here is what I see happening based on current events. This is the first of three parts. The first will focus on global regional commentary. The second will focus on investment areas and the third will tie the first two together. Europe will be marked with a growing divergence between the economically strong countries like Germany and France and the PIIGS. As the year progresses expect Spain and Portugal to accept programs similar to Ireland and Greece. Current chairman Trichet’s term ends on October 31, 2011 and there will likely be an internal tug of war between the PIIGS who would want a dove and Germany and France who will be pushing for a hawk. In September, Trichet made some criptic comments in a speech saying that the problematic countries need to get their collective houses in order soon or risk being left behind. Germany’s exports will continue to carry Eurozone growth in 2011. If the Euro begins to decline versus the US Dollar and global currencies we may begin to see inflationary problems as the year goes on with Germany possibly pressing the ECB to removing some excess credit. This will provide the new ECB President with his first and possibly most important test. Will he be an inflationary hawk with a nod to removing some excess credit measures and attempting to get ahead of the inflationary curve or acquiesce to the PIIGS who will need a time to heal their sovereign balance sheets. Europe will survive intact helped in part by their current account surpluses. Inflation will begin to turn its ugly head as 2011 goes on. Right now Asian central banks have begun a tightening cycle aimed at removing excess credit and attempting to stay ahead of the inflationary curve. Unlike the late 1990’s Asian economies are on a much better footing to fight inflation with significant excess reserves, low debt ratios, and a willingness to move ahead of the inflationary curve. One significant fly in the ointment is not coming from China but Australia, whose interest rate increases are slowing the Australian economy almost to the point of a recession. The ripples here will likely be limited to Australia and New Zealand. Japan will continue to muddle along economically. This may upset market participants as many people have bet on some sort of crisis but Japan has continued on this path for more than a decade now. One area which may help economic growth is the Japan-Thailand FTA in which Japan has begun to outsource low end production to Thailand which is then exported to Japan where final assembly and export to the world takes place. Benefits from this FTA should become apparent as the year goes on. The key for Japan will be a rise in exports combined with lower public spending. While this may continue to hold back economic growth a retraction in the public sector would be good for the Japanese economy long-term. India and China will lead the rate raising cycle with increases of at least 100 bps expected across the board. Argentina remains the wild card for South America. South America is undergoing an incredible economic growth story built upon the economies of Brazil, Chile, and Peru. Central banks across the region will continue on a rate tightening cycle in an attempt to stay ahead of the inflationary curve. Argentina remains a huge political risk with elections in 2011 with inflation already out of control. In Canada, a combination of the H.SI implementation and high consumer debt levels will put a cap on the economic recovery. This is very good for the long-term. Canada is ahead of the Federal Reserve with respect to interest rates. Baby steps are being taken to let the air out of the bubble and it is likely this will continue as 2011 goes on. We will likely see a couple of rate increases as the Bank of Canada would like to normalize interest rates but is very cognizant of the high debt levels and slow economic recovery. The divergent economic policy relative to the United States will continue. No interest rate increases by the Federal Reserve until mid 2012 at the earliest and more than likely a slow incremental rate increase policy will begin in 2013. Not until the mortgage resets have made their way through the system will the Federal Reserve entertain the thought of raising interest rates. There is a tremendous aversion by consumers in the US to leveraging up. If you were foreclosed on and went back to renting it is unlikely that you have 20% for a downpayment after losing a house purchased with no downpayment. We will continue to see problems and the grey market overhang will continue to depress prices. There will be isolated pockets for growth but that is more driven by vulture buying. Economic growth in the US will be higher than this year but lower than 4% with building inflationary pressures in the food and oil markets. The rush of voters to elect new candidates to Washington has changed the political landscape. Never before has the country experienced a split Congress with a Democratic President. The question will be how closely will they move to cut spending when a strong proportion of the American public is against cutting Medicare, Social Security, and Defense and how quickly will the public turn on them when the spending is less than expected. Right now the 2012 Presidential race has yet to kick into gear but as the year goes on the drumbeat from candidates canvassing Iowa will pick up and grab more and more of the headlines. Expect lots of bluster and backpeddling from the new Congress. Notice how they are already going back on the earmarks promise before taking office. That will be something major to consider for the 2012 election. Good economic growth will help tax receipts but I do not see any strong impetus to get spending under control. A great way to slow economic growth and help the Federal Reserve put off increasing interest rates (this creates new problem) would be to combine an increase in tax receipts through lower capital gains, dividend, and overseas profit repatriation tax rates with decreased spending. That would show the world that we are taking our budget deficit problem seriously. If that happened as businesses and employment began to gain traction the government would be creating a drag to ensure we do not grow to fast and let inflation get out of control. BTW, I am not a Keynesian. The above policy just makes sense to me at this point in time. Canada (TSX) – The TSX broke out of its downtrend in late August and made new highs for the year. On the chart below, we have a double top made last week. If the TSX pulls back in the coming week it will likely move back to the 12300 support level. This week will herald some important news, which I will discuss tomorrow. S&P 500 – The S&P 500 is at a resistance level, which needs to be taken out before it can make a move to the 1220. It appears as though technically we may be in the process of making a top similar to the one made earlier this year. While the S&P may push through these levels and continue to move higher it is possible that we see a pull back around the end of October/early November for the reasons we stated last week. I am not short the market BUT looking at the speed at which selloffs occurred this year, it would be prudent risk management to protect your trading gains by tightening up stop losses in the event we see a sell off as traders and hedge funds choose to lock in performance gains for the year. Dow Jones Industrial Average – We have had a nice move up over the past two weeks bouncing off support and now we find ourselves in a virtual no mans land between the 50 and 200 day moving averages. Technicals are positive but inconclusive as we wander in this trading range between 10400 and 9800. Traders and fund managers return this week and there are some items which should dominate headlines namely concerns out of Europe, 3rd Quarter corporate profits, important economic reports namely CPI, PPI, Capacity Utilization, Industrial Production, and the upcoming mid-term elections. 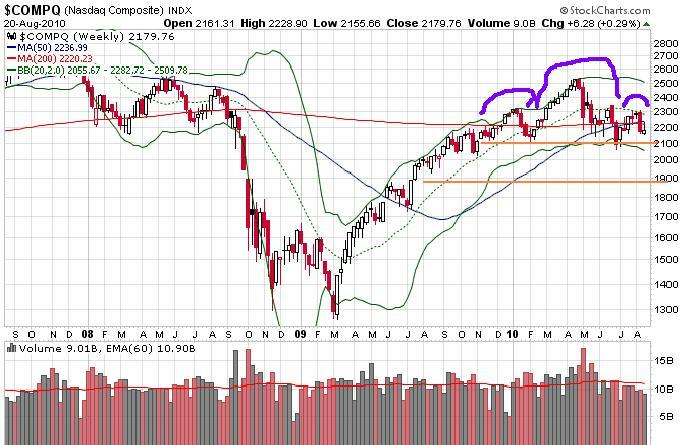 Caution is warranted here unless we can break above the 200 day moving average and clear the 10500 level. It is possible that we start the week with a rally but have it lose strength as the week goes on. Longer-term we need to move above the 50 week moving average to move back to the 200 week moving average. I would be hesitant to put any new capital to work on the long side until we have a confirmed breakout above resistance and the trend establishes itself. Dow Jones Utility Average (UTIL) – The Utilities were added because there is something interesting on the daily chart relative to the Industrials. Check the RSI and MACD as they seem to be in the process of rolling over while Friday’s down volume was heavier than normal. This bears watching as the week goes on as the Utilities may be leading the market and flashing a sign. 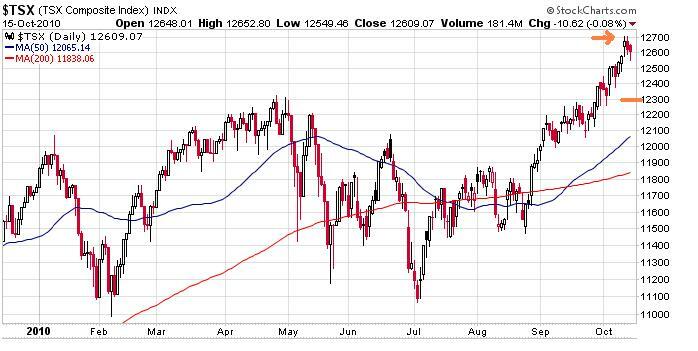 Canada (TSX) – The TSX is in a long basing pattern. Economic reports over the past week gave investors some pause with the possibility of 3rd Quarter growth coming in weaker than expected due to a slowdown in the US. 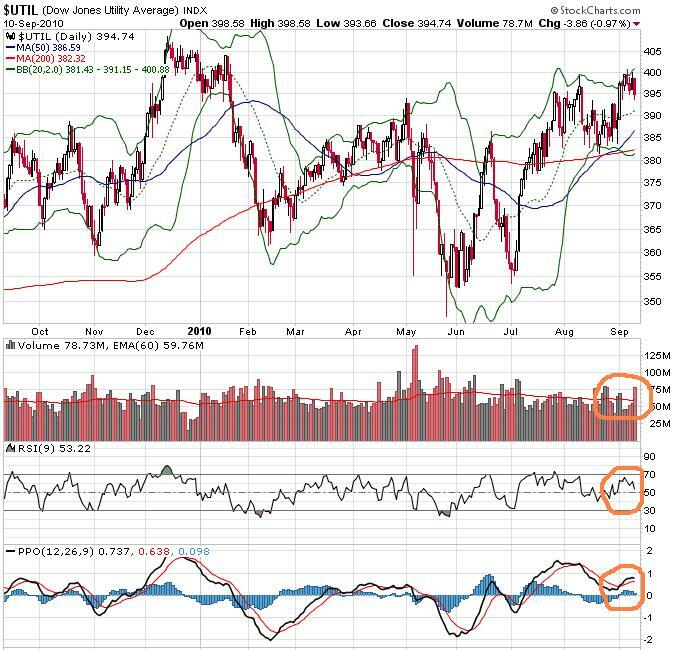 Technical indicators look overbought and investors would be well served to hold off on any buying in the event the TSX pulls back in the coming weeks. A move above 12250 would signal a breakout and move higher. Slow trading dominated as the Rosh Hashanha holiday on Thursday and Friday along with Labor Day on Monday caused traders and managers to take an additional week off. The Reserve Bank of Australia held the line on interest rates ‘for the time being’ while 2nd Quarter GDP grew by 1.2% QoQ and 3.3% YoY. The Bank of Japan held interest rates steady and said that they were prepared to add more monetary stimulus to the economy if needed. The Bank of Canada hiked rates to 1% and in a brief statement which showed no real bias but gave a mention to a slightly weaker than expected US recovery. The South African Reserve Bank (SARB) cut its policy rate by 50 bp to 6%. Markets view this rate cut as the final one as the recession was quite mild for South Africa compared to the rest of the globe. Economic growth has been recovering, boosted this year by the World Cup, and now appears to be moderating. The SARB has been in a more restrained rate cut cycle and appears to be having success against inflation as the CPI is now in the 3.5-4% area down from around 11% in 2008. The Bank of England and the Bank of Korea both kept interest rates at current levels. Stocks moved up this week led by better than expected economic reports and a rebound from oversold conditions. The US ISM rose to 56.3 countering many regional reports which indicated a weakening manufacturing sector. US unemployment held steady and was taken by the markets as a net positive after some worse than expected job numbers the past two months. The ECB kept interest rates unchanged during their meeting this week. In an odd move, the ECB announced before the ECB conference a plan to ban naked short sales of stocks and government debt. Sweden’s Riksbank raised repo rates by 25 bp and indicated that they will continue to raise rates going forward. Have a great Labor Day weekend everyone. 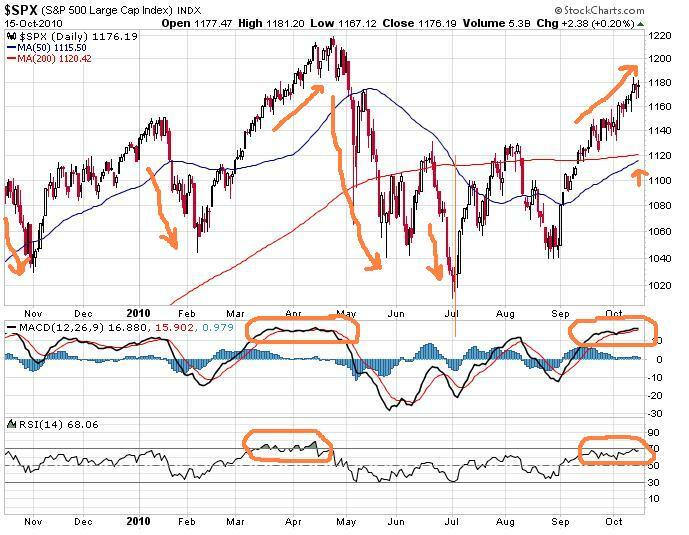 S&P 500 – The short-term charts look weak but close to oversold levels. This means we could get a short rally next week if economic numbers are not disappointing. We do have a double top at 1130 and another at 1100 and they are resistance levels. The Labor Day holiday will affect trading this week and next with smaller than normal volumes. On the longer-term charts, the S&P fell below its 50 week moving average (1100) and was unable to climb above last week, possibly turning it into a resistance level if we are unable to make a move above it in the next few weeks. The 1100 level is becoming an important psychological barrier for the markets. If we are unable to break through it is likely we move back to the 1050 level and then 1000. On the weekly chart you can see a clear head and shoulders top tracing itself out. Right shoulders can drag themselves out for sometime so this may take a bit longer than expected to resolve itself. It is not a pretty chart but 1000 will provide a major psychological support level for the market. NASDAQ – The short-term charts show an index searching for direction after the sharp drop 2 weeks ago. We seem to be rattling around between 2225 and 2160. Just like the S&P we may see a short rally next week with the Labor Day holiday. The longer-term charts are once again telling the story. The weekly charts shows a golden cross with the 50 week moving average oh so slightly above the 200 week moving average but last weeks rally was not able to take us above the 50 week or 200 week moving averages (2237 and 2220 respectively). More importantly, the head and shoulders top is much more pronounced here than the S&P. Traders are looking at these charts with trepidation. TSX – Clear downtrend on both the short and long term charts with prices making lower highs and lower lows. The TSX is at the upper boundary of its trading range and seems to be looking for direction. The 50 week moving average has become a support level at 11622 with moves below being met with buying. If the TSX falls breaks below 11622 we are likely to see a move down to 11000 which would be the lower end of the trading range. Economic statistics out of the US are likely to guide the Canadian market as investors will worry that a slowdown in the US will filter back to Canada. The US stock market is at a critical level. Economic statistics have been weak signaling a slowdown and there is the potential for 2nd Quarter GDP to eventually come in a full percent lower than first reported. Markets have been pricing in strong economic growth and it appears as though growth will be coming in below forecasts. In addition, we have a Hindenburg Omen signal which was confirmed on Thursday and Friday of last week. The Hindenburg Omen does not guarantee a crash but it does signal significant underlying weakness in the stock market. If the market does move lower there is a chance some of the charting signals resolve themselves in a manner which will disappoint investors. This is not a time when investors should be adding to equity positions unless you are using short ETF’s as a hedge. Investors should be on the sidelines waiting for a trend to establish itself and getting cash ready to allocate. Once again, I am not calling for a crash but investors should be aware of what Mr. Market is telling us. Economic and technical indicators are showing weakness and investors should be on the sidelines until a trend establishes itself. Technically, the daily chart is having a nice rally through the 50-day moving average and after factoring in the bearish sentiment as measured by AAII this rally may have some legs in the short-term. 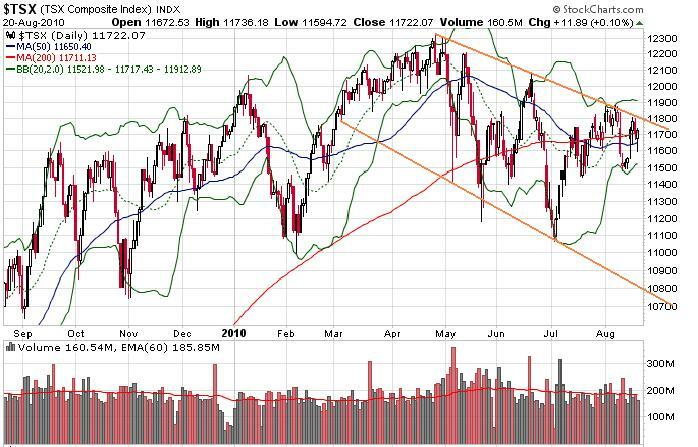 In order to turn positive the market is going to have to move through the 200-day moving average AND the June high, which would set the stage for a rally up to the April highs. The weekly chart is bearish with a potential head and shoulders top formation and resistance at the 50-week moving average. Failure to break through resistance will be a significantly bearish indicator and will likely signal a move to new lows on the year. The monthly chart is bearish and has been so since March when the stochastic peaked and we tested resistance at the 50-month moving average. 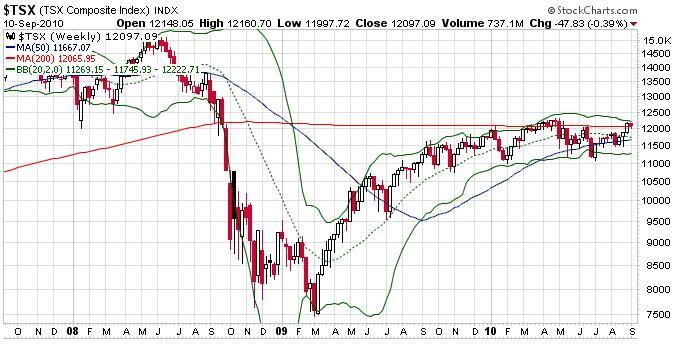 Currently we sit at an important crossroads testing support at the 200-month moving average. Failure to maintain this support level is a very bearish sign and sets the market up for a possible retest of previous lows. 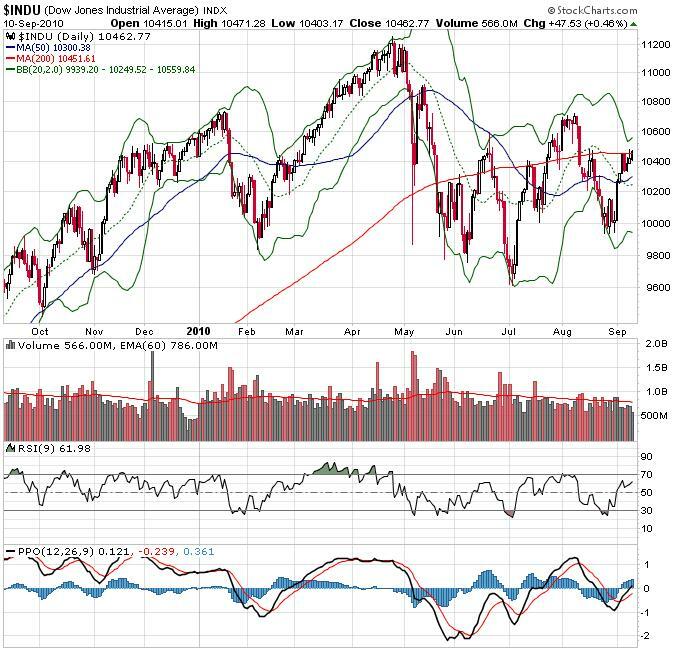 The daily charts of the NASD have just pushed through the 50 and 200 day moving averages with the next target the June highs. Technical indicators appear to be getting close to overbought territory and how the index behaves as it approaches the June highs will determine if this is a short-term top or preparation for a move to test the April highs. The weekly chart is a bit more bullish as the index has just pushed through a convergence of the 50 and 200-week moving averages. A head and shoulders pattern is in the process of forming attention should be paid in the event the current rally runs into resistance in a few weeks time. The monthly chart has just pushed through a key resistance level with the 50-month moving average. While the technical indicators are bearish, it is not inconceivable that the current rally continues for a small amount of time before finally rolling over. On the daily charts, the TSX is tracking the Nasdaq Composite. Having already moved through the 50 and 200 day moving averages the next test will be the recent July high, which stands very close to Friday’s close. A move higher would mean the TSX would likely test the June highs then the April highs. It is possible the TSX will lead the US and provide market leadership over the coming weeks. The weekly chart shows a range bound market with the 200-week moving average providing significant technical resistance. A move through the 200-week moving average would be a significant technical breakthrough and a bullish signal but as we approach that point we may see the market enter into overbought status. The monthly chart is showing significant technical resistance at the 50-month moving average level that is approximately 200-week moving average level. 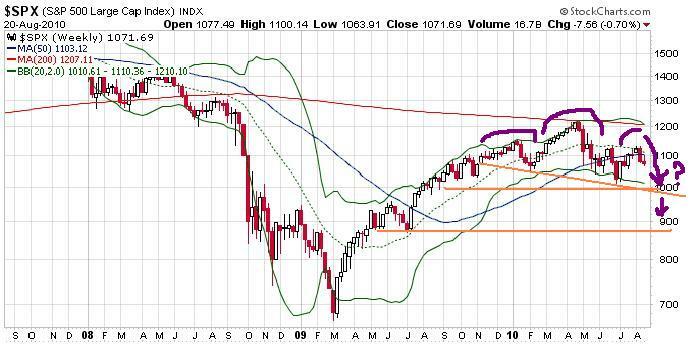 A move through this level would be a very bullish indicator for the Canadian markets. It is possible that the Canadian markets diverge for some time with the US markets as the Canadian economy as a whole emerged from the downturn relatively unscathed and the Canadian banking sector is rock solid. The biggest concern would be a slowdown in the US caused by a lack of hiring, weak banking sector, a weak housing market, and slow consumer demand. Since a significant amount of Canadian exports are dependant on the health of the US economy Canadian economic growth will likely slow over the second half of 2010 into 2011. A strong banking sector and vibrant consumer demand will allow the Canadian economy to weather and stormy seas caused by a slowdown in the US allowing the Canadian economy to be in the sweet spot globally with moderate economic growth coupled with low inflation. So far, our beginning of the year call to be long the first quarter and short thereafter has been correct and the market appears to be following the expected path for 2010. Looking back over history and the four-year Presidential cycle, the stock market’s low in the 2nd year of a Presidential term provides a nice rally into the third year as the President gears up for his reelection campaign. Currently, the cycle was thrown off by the crash in 2008 along with the sharp rebound in 2009 but should return to form this and next years. Within the larger 10-year cycle, the stock market has negative returns during the first few years setting the stage for positive returns later in the decade. Investors should remember that while stocks are cheap, in the context of a long-term sideways market, it does not mean they cannot get cheaper. Classic bull markets start in times of cheap stocks, as measured by PE’s, over a long-term horizon. It is likely that PE’s will continue to move lower as we see earnings increase over the next few years setting the stage for the next classic bull market. With the indices led higher by low quality stocks and typically underperforming markets leading the way investors should be wary over the rest of the year until a tradable low is in place. While the market continues to churn it is best if investors wait on the sidelines for the dust to clear.